Very Good. Moving full circle from Joe and Rose's private wedding in the Archbishop of Boston's personal chapel, to John and Carolyn's secret nuptials in a former slave chapel on a secluded island, this text takes the reader to each event. Trade paperback (US). Glued binding. 192 p.
Very Good. Glued binding. Paper over boards. With dust jacket. 178 p. Contains: Illustrations. For three generations the Kennedy family has been in the public eye, and their marriages have been the equivalent of royal matches in Britain. 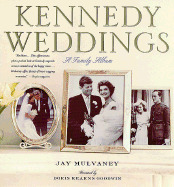 This portfolio begins with the dynastic marriage of Joseph P. Kennedy and Rose Fitzgerald, then describes the second and third generation marriages.